UDM Downloads > Get File Size! 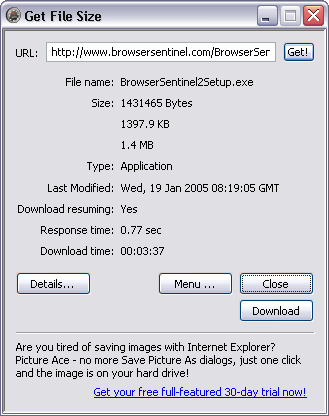 Get File Size is an Internet Explorer add-on that allows you to find out the size of a file before downloading it. Get File Size does not require any special skills, just right-click the link to a file and select Get File Size, the program will immediately show you the size of the file. Moreover, Get File Size will show you the date when the file was last modified, file type, server response time and response headers, estimated download time. If the requested file is an image, Get File Size will determine the image dimensions before you start downloading the image.